This morning we were lucky enough to attend the Wand Installation in aid of Lumos at Peter’s Hill (more on that later) where we were given the opportunity to ask legendary Wizarding World prop modeller Pierre Bohanna a question. This is the wand we built originally for Dumbledore and this is the wand that Jude used throughout the main production but when Jo saw that, she loved it, apart from she felt it was too much like the Elder wand. So it was changed for some reshoots and then they did the changes in post production to the wand with the swirl, which is beautiful aswel! I really like this one but I absolutely get what she’s saying, she’s right, but it was one of my favourite wands to make because it’s almost like it’s made out of black quartz, it’s like a fossilised wood, not coal but it has a beautiful, really really….it’s full of carbon fibers. It’s clear with carbon fibers and fiberglass so it gives a very crisp line, translucent, it was great. It would have been a nightmare for Noble to make! 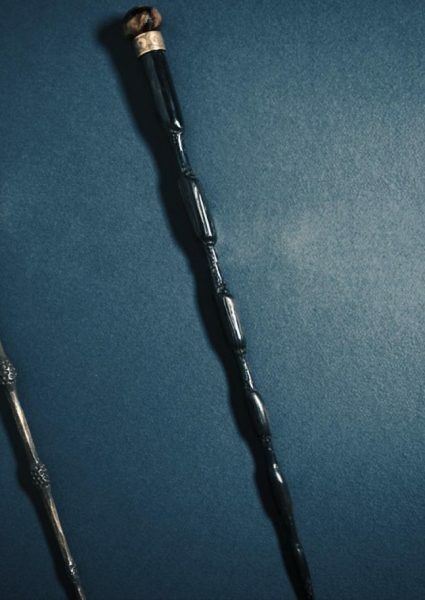 It’s likely this change in wand design is also why Dumbledore’s is the only wand with a late release date from Noble Collection. Special thank you to Warner Bros for such an amazing morning and opportunity – the rest of our coverage will be up soon!